Daimler's leaders will have to decide whether to offer more free sausages next year. Was this the Wurst AGM ever? A fight over free sausages has marred Daimler's annual shareholders meeting. Investors should have been cheered as the German automaker, which owns Mercedes and Smart, announced its highest ever dividend. But instead police were called to break up the fight at Wednesday's meeting. According to a Daimler (DDAIF) spokeswoman, one male shareholder started placing several sausages into a box. "I suppose he wanted to take them home," she said. It provoked ire from another shareholder, a woman, who told the man it was not the right thing to do. A dispute ensued, culminating in the police being called and the female shareholder filing a complaint for slander. "We had 12,500 of these sausages for 5,500 investors attending the meeting," the spokeswoman said. That's over two sausages for each investor attending. Demand could have been high since the sausages in question were "Saitenwuerschtle," a regional delicacy also known as a "Wiener" or "Frankfurter." 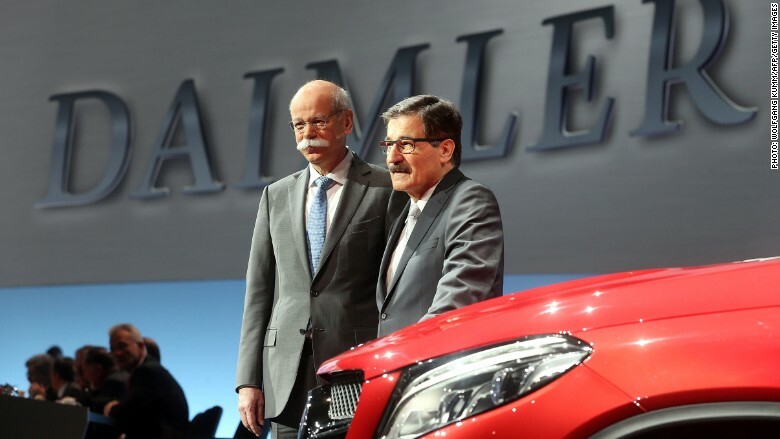 The spokeswoman said Daimler's chairman will now have to decide whether to increase the company's order of sausages for the next annual general meeting, or to get rid of them altogether for fear of another frankfurter fracas.